Anna Myer and Dancers, North American Family Institute/Youth Link, and Bennington College present a new iteration of the dance, music, and spoken word pieces “Hoop Suite” and “Hindsight Now” on Saturday, July 13 at 8 p.m. in the VAPA Theater on the Bennington College campus. Tickets are $12 for adults and $6 for children under 18. This performance is funded in part by the New England Foundation For the Arts Expedition Touring Grant. Choreographer Anna Myer joins co-director Jay Paris, and musical director Ronald Feldman, introducing this exciting work in Vermont for the first time. The energy and rhythm of the city pulses through the dancers as they swoop and glide with the movements of orange orbs – The Hoop Suite Project is arriving in Bennington. This large-scale collaboration integrates multiple art forms – poetry, contemporary dance, hip-hop, rap, classical violin, and cello. The work has been performed both on traditional stages and on basketball court “theaters.” Since its inception this project has offered Boston’s inner city youth a vital opportunity to join seasoned artists to develop and perform their personal stories for diverse audiences. Now it is being presented to the theatergoing public, students in area schools, and residents in public housing. Through literacy and the arts, Hoop Suite offers a new platform for creative expression from unheard voices seeking positive social change. These performances are thanks to Youth Link, an initiative of North American Family Institute directed by Jay Paris, and Anna Myer and Dancers. Hoop Suite is a rap opera that has evolved from a unique collaboration between one of the Boston’s top performing dance and theater companies and youth from Boston's toughest public housing developments. Anna Myer has choreographed Hoop Suite to a score by Jakov Jakoulov and Igor Tkachenko. Hoop Suite is inspired by Myer's previous work, Street Talk, Suite Talk, as it melds classical music and dance with spoken word, rap, percussive instruments, and hip-hop movement. Hoop Suite takes an emboldened step forward by incorporating inner-city teen artists and encouraging them to explore dance, poetry, and behind the scenes technical work in a professional setting. 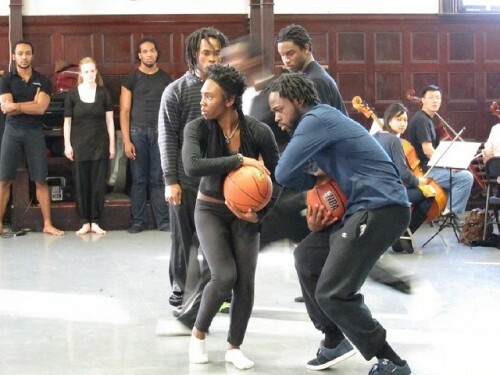 Hoop Suite debuted as a theater-in-the-round on the basketball courts of three different Boston housing developments, where audiences from all walks of life shared the stories of coming of age in the inner city. This new iteration of Hoop Suite with a larger group of young people brings a storyline, new poetry, dance, and musical voice to the mix. In addition to this performance at Bennington College, it will be presented in Boston again this summer in inner city basketball courts, at Bridge Water State College, at the Strand Theater, Boston, and Roxbury Center For Arts. In spring 2014 the piece will tour to New Haven, CT and Providence, RI. This production is being created and designed as a boilerplate for a national tour that will integrate local young artists into the work. As the title Hindsight Now suggests, the theme is transformation. Hindsight Now uses the gift of hindsight to inform, fuel and enrich the moment of now in a quest for wholeness. Deeply personal and universally sweeping, the work careens through a gauntlet of near-defeat and glides into alchemy, turning dark to light, gray to gold. Set against a backdrop of projected photos by Abelardo Morrell, nine Anna Myer Dancers, four cellists, and four violinists will perform to music score composed by award-winning Igor Tkachenko and conducted by Ronald Feldman. Anna Myer has led her dance ensemble for over twenty years. She began her dance training in 1962 with Esther Brooks at the Cambridge School of Ballet on a Ford Foundation Scholarship. After receiving scholarships from the Joffrey Ballet, The School of American Ballet, and American Ballet Theatre, Myer joined the Boston Ballet, and later studied and performed with Ana Roje. Anna Myer and Dancers (AMAD) has a long history of artistic collaboration, using live music, original scores, and people of various ages and backgrounds. Examples of these processes include Myer’s partnership with neon sculptors Alejandro and Moira Sin to create Penumbra (2007). Another piece, All At Once (2005), was conducted by Susan Davenny Wyner, featured 9 dancers, 12 musicians, and has been performed by various ensembles including the Julliard Student Ensemble. Street Talk Suite Talk (2008), a rap opera, juxtaposes the poetry of eight young inner-city rappers and an original score by Jakov Jakoulov. Boston Mayor Thomas Menino’s Office of Arts and Tourism presented STST at the Strand Theater reopening, which received a televised preview on WGBH and rave reviews: “Anna Myer may be the gutsiest choreographer on either side of the Charles River these days" (Thea Singer, The Boston Globe). Working with Anna Myer, Jay Paris is the creator of the story line of the pieces and he directed the spoken word artists and rappers. A graduate of Bennington College and director of the North American Family Institute/Youth Link, Mr. Paris has worked with Anna Myer to produce this concert. His career in the arts has spanned photojournalism, magazine writing, editing and publishing. He is the author of three books, including the best-selling, Walking Nova Scotia, and Too Young to Die. As a magazine writer and editor, he has received numerous awards for his feature stories and columns. Mr. Paris holds an MFA in Creative Writing from Bennington College and has pioneered writing workshops for youth at-risk, collaborating with Anna Myer and Dancers since 2012 to create The Hoop Suite Project. Conductor Ronald Feldman was twice winner of the American Symphony League’s ASCAP Award for Adventuresome Programming of Contemporary Music, Ronald Feldman has achieved critical acclaim for his work as conductor and cellist. He has appeared as guest conductor with major orchestras such as the London Symphony Orchestra, Boston Pops Orchestra, Rochester Philharmonic Orchestra, the Saint Louis Symphony, and the Quebec Symphony, as well as many regional orchestras including the Pro Arte Symphony, Springfield Symphony, Albany Symphony, and the Amarillo Symphony. After successful appearances as guest conductor for three consecutive seasons at Symphony Hall and at Tanglewood, the Boston Symphony’s summer home, composer and Conductor John Williams appointed Mr. Feldman Assistant Conductor of the Boston Pops Orchestra. He served as assistant to John Williams from 1989-1993. Mr. Feldman joined the Boston Symphony at the age of 19. He has appeared as cello soloist with many orchestras performing a wide range of concerto repertoire from Dvorak to Ligeti.